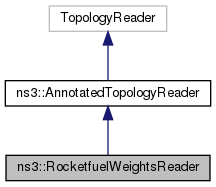 Topology file reader (extension of Rocketfuel-format type). Definition at line 39 of file rocketfuel-weights-reader.hpp. Definition at line 63 of file rocketfuel-weights-reader.hpp. Definition at line 58 of file rocketfuel-weights-reader.cpp. Definition at line 73 of file rocketfuel-weights-reader.cpp. Definition at line 79 of file rocketfuel-weights-reader.cpp. This method opens an input stream and reads the Rocketfuel-format file. Every row represents a topology link (the ids of a couple of nodes), so the input file is read line by line to figure out how many links and nodes are in the topology. Definition at line 85 of file rocketfuel-weights-reader.cpp. 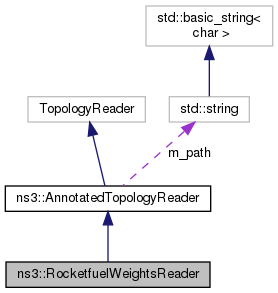 References ns3::AnnotatedTopologyReader::CreateNode(), LATENCIES, LINKS, ns3::AnnotatedTopologyReader::m_nodes, ns3::AnnotatedTopologyReader::m_path, POSITIONS, ns3::AnnotatedTopologyReader::Read(), and WEIGHTS. Definition at line 187 of file rocketfuel-weights-reader.cpp. Definition at line 90 of file rocketfuel-weights-reader.hpp. Definition at line 96 of file rocketfuel-weights-reader.hpp. Definition at line 102 of file rocketfuel-weights-reader.hpp. Definition at line 108 of file rocketfuel-weights-reader.hpp.